Quartz Mountain, also known as Baldy Point. It’s safe to say that Oklahoma is not known as one of the climbing centers if the country, but that belies the fact that there is excellent climbing and bouldering in the Wichita Mountains near Lawton. 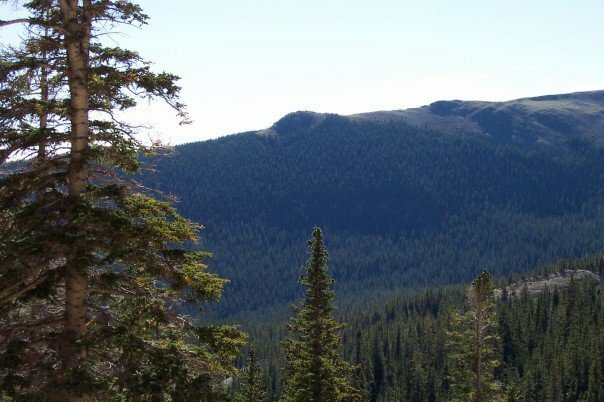 One of the prime spots is Quartz Mountain, sometimes known as Baldy Point. 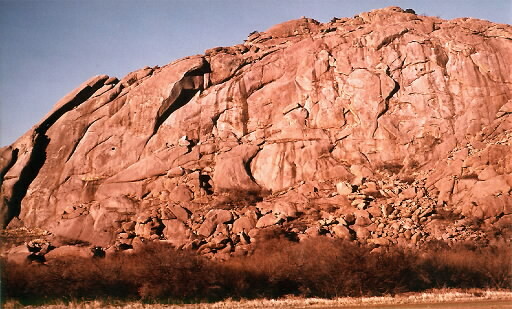 Multi-pitch trad routes await on this granite wall that rises out of nowhere on the southwestern Oklahoma prairie. It’s also the spot for the Quartz Mountain Spring gathering, which is happening April 5-7. Work is going to keep me from being there, but if you’re in Oklahoma or north Texas and want to get your climb on with a cool crowd, make a weekend of it. I was reading on a Facebook page for this event a few things that are good to know. Camping is $3 per person per night. There are showers nearby. Camping is pretty much right at the foot of the mountain, so there is a minimal approach and immediate access to a whole bunch of routes to try. Help us protect this pristine area and the privilege to gather here by minimizing your impacts. 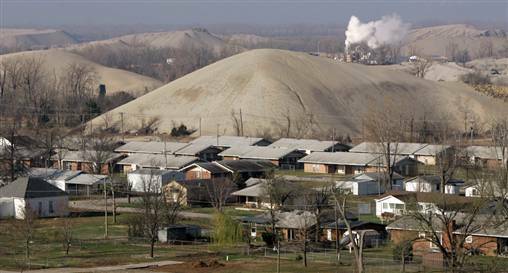 Please disperse your tent sites, make use of the restroom facilities, and carry-out all trash. By doing so, you will insure that Baldy’s natural resources are protected and that the Park continues to grant the climbing community a special use permit for future events. 8) Bivying and tent camping are permitted 100′ east of the parking lot. If you want to know more about this event or the Wichita Mountains Climbing Coalition, check out this site. 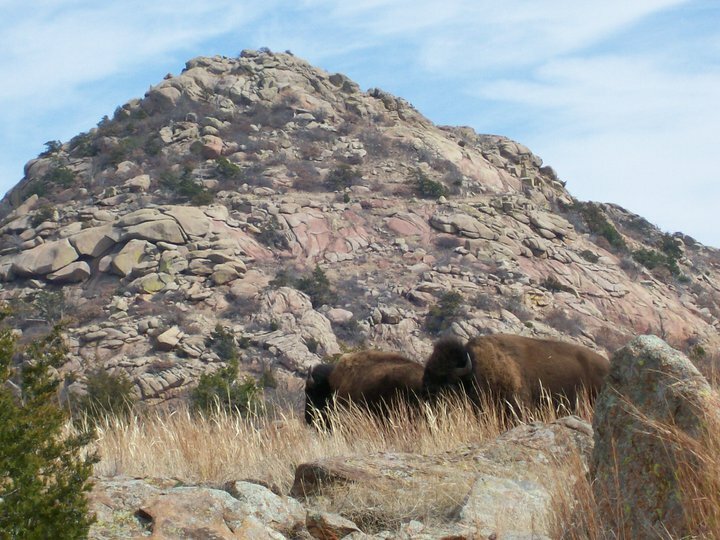 If you have the time and the urge, you should definitely check it out, and maybe do a little exploring in the Wichita Mountains Wildlife Refuge while you’re at it. I’m not kidding when I tell you this area is chock full of excellent hiking, climbing and wildlife viewing opportunities. For more information about Quartz Mountain, as well as directions to get there, go to this link. Enjoy! Did you ever wonder what might go through your head when your life is at stake? What would you be thinking about as life appeared to be slipping away? Or when you’re confronted with a threat? How do most people react? How would you? Risk. Danger. Those situations where it appears death may be at hand. Most of us don’t have to worry about this in our day-to-day lives, and indeed, most of us won’t confront it at all until our number is up. We’re genetically designed for self-preservation, but intellectually capable of overriding those instincts to do things that are dangerous. At first glance, it’s classic fight-or-flight, but for most of us, it’s much deeper and more complicated than that. Part of being a reasoning being – humans may be alone in this capability – is that we can contemplate our own demise, and what it means. The confluence of instinct and reason creates some interesting progeny. Toeing the line between survival and risk-taking has helped human beings push the boundaries of exploration, achievement and daring-do. But on an individual level, it tends to be a lot more basic, more raw. I was reading a blog post in which the writer describes a dicey situation in which she and a friend of hers, running on the Appalachian Trail, had a run-in with a couple of men who appeared to be a bit on the sketchy/creepy side. It was interesting to see how these two women dealt with the situation, striking the balance of fear and action to get themselves out of a potentially sticky situation. It got me thinking about a few situations I’ve confronted. It’s not like I put myself in danger all that often. I’m not a cop or a soldier, and I don’t hang from the gnarliest of crags a la Alex Honnold, unroped and hundreds of feet in the air. But stuff happens. Looking back, I’m a little fascinated at what went through my mind during those times. In an instant, a hostile wildlife encounter can test your ability to think clearly when the stakes are high. 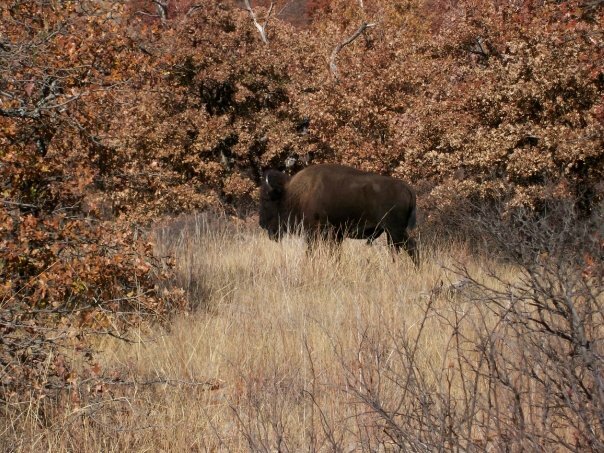 I’ve written about a certain buffalo encounter I had a couple of years ago, one in which the beast briefly charged at me before turning away and running down the trail. Had it wanted to, it could have trampled or gored me, and there would have been nothing I could have done about it. I didn’t even see the thing until it burst out of the brush. All I can tell you was how I reacted: A muffled “Whoa!” and a sidestep, and then I watched it as it turned to stare me down. I was surprisingly calm, and my heart rate didn’t rise for another minute or so, well after the initial moment of danger had passed. That’s the only hostile wildlife encounter I’ve had, and I feel pretty fortunate to have escaped it unscathed. But in my mind, I wasn’t freaking out. It was more of a “Huh. Well, that was close.” And then I moved on down the trail, making a little more noise and looking a little deeper into the woods for other creatures hiding in the underbrush. Other instances were not nearly so sudden. I’m thinking of another time, four years ago, when I was walking around with a latent case of pneumonia (is there really such a thing?) that suddenly got a lot more serious in a place that was pretty far from anywhere I could get medical attention. What I was faced with was a step-by-step degradation of my physical condition that started out seemingly benign, but later snowballed into something more serious. 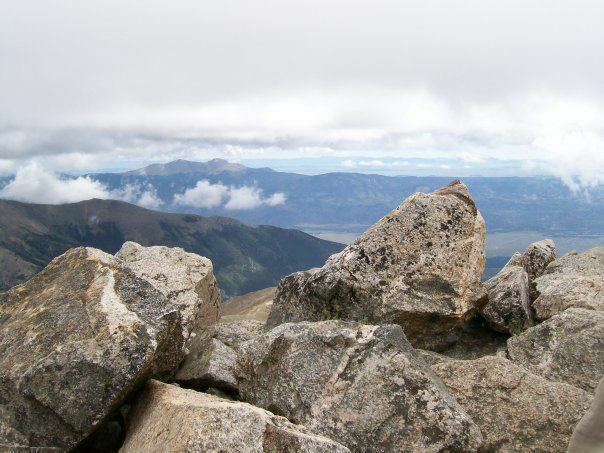 The view from 14,169 feet is pretty spectacular, but it’s no place for a medical emergency. When it happens, decision-making becomes key. 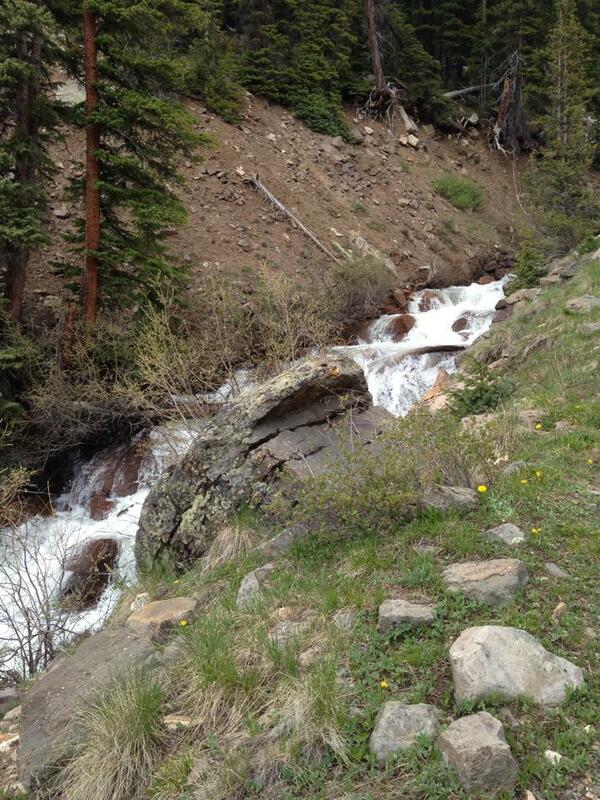 I was hiking up the Denney Creek Trail on Colorado’s Mount Yale, hoping to gain its 14,169-foot summit before noon. 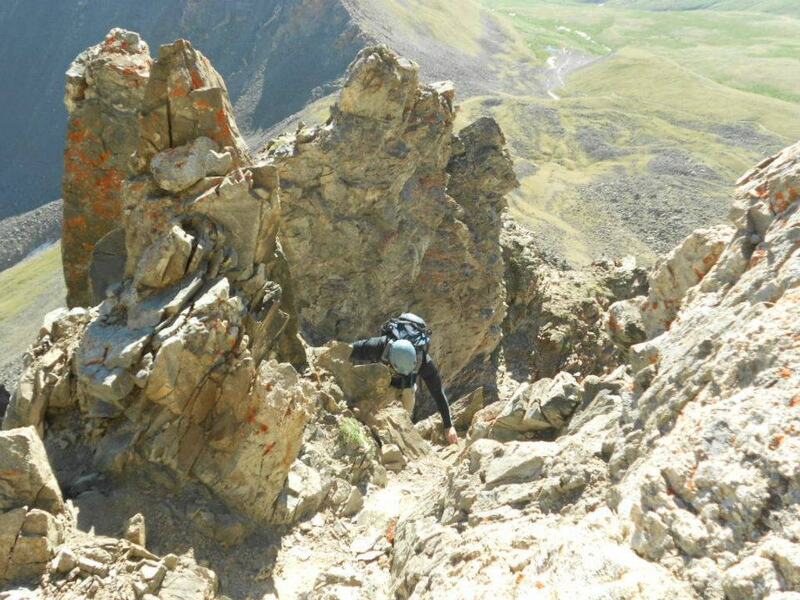 Initially, I started out strong, but as I topped 12,000 feet I started to wear down. No big deal. A lot of flatlanders like me get tired at higher elevations. Past 13,000 feet, I started feeling a side-stitch on my right side. Cramps. Was I not properly hydrated? I kept drinking and took my time, but that cramp never abated. Probably because of the continued hard work my heart, lungs and legs were doing, I reasoned. It would pass once I started down from the summit. But it didn’t. And though I was dressed for the conditions, I felt unusually cold. If I stayed still, I shivered. When I moved, I couldn’t catch my breath. And the side cramps were still there. Then I started seeing things. Mistaking nearby rocks for friends. Something was wrong. Weather started moving in. I was falling a lot, and getting weaker. I was afraid of getting caught out in the open by a storm, but treeline was still a long ways away. My progress was slow. Now I started thinking I was in trouble. With my situation deteriorating and my condition weakening, I had choices to make. Do I stop, eat, and hydrate, or try to fight through it and push on to treeline before the weather hit? It was sort of self-triage. I chose the former. Nearly barfed up the food I tried to eat. Ran out of water. And the delay did leave me caught in worsening weather, but gratefully it was just light rain. Even though I was hallucinating a bit and a bit worried about my state of being, I leaned on a lesson I’d been taught: Keep making decisions. I never thought my life was in danger, but in fact, it may have been – an X-Ray at a hospital later on showed my right lung 75 percent filled with fluid, and those side cramps were symptoms of fluid forming on the outside of my lung and heart. That last condition can kill you. So yes, kids, pneumonia can also cause altitude sickness, in case you’re wondering. But it doesn’t necessarily cut into your ability to make important decisions and get yourself to safety. I keep thinking about a much more extreme example of critical thinking in dangerous situations. Aron Ralston comes to mind. Talk about keeping your head under extreme duress! He’s got me beat, and probably almost everyone else on the planet as well. But I can remember another incident where I had more than enough time to think about the idea that I was about to cash it in. This was also about four years ago. Southern Thailand is one of the most beautiful places on earth. Its fine-sand beaches are often guarded by towering limestone cliffs, and the place is popular with beachcombers and climbers. Paradise on earth. But the waters here are deep enough to take you down and keep you there. 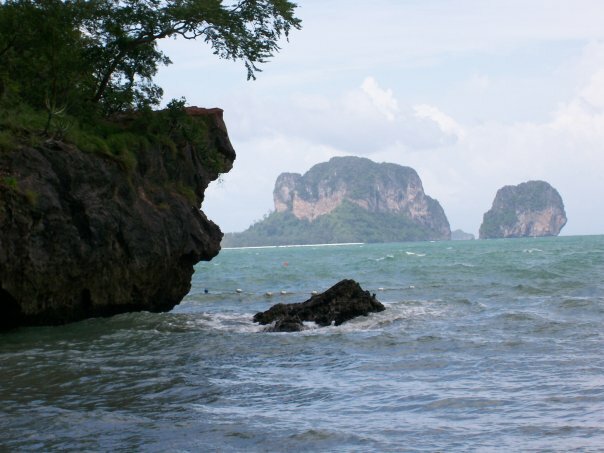 I was with some friends on a mission trip, and we were taking a break on Railay Beach – not too far from Phuket – when we went scrambling around some shoreline rocks and came up to a short cliff, maybe 20 feet or so, overlooking the mouth of gorgeous cove. The waters were a little rough, but they were deep just below us. Jump off cliff. Land in water. Swim back to the beach 150 yards away. Repeat. Unfortunately, I’m not the best swimmer. Physically speaking (maybe mentally, too?) I’m pretty dense and not very good at floating. I can get by in good conditions, but even the best swimmers in our group were finding the swim back to the beach a real grind. I jumped. It was exhilarating. I splashed, sank deep, touching nothing. Then bobbed back up to the surface. After shouting encouragement to my friends above, I began the swim back to shore. Then I got tired. I stopped to float a bit and rest, but kept sinking. So I tried to swim again. And got more tired. In less than a minute, my fight against the waves and undercurrent started to become a losing affair, as each attempt to resurface became more brief and increasingly urgent. Then I inhaled my first gulp of sea water. While my mind was mildly annoyed and not yet panicked, my body was in full-on freak-out mode. When you’re drowning, the body becomes desperate for oxygen. The more fatigued you get, the harder your body has to work to get to a place where gaining a gulp of air is possible. You work harder, your muscles get more tired, and the ability to get oxygen becomes more compromised. It’s a cascading effect in which the body then edges closer to a panic state. If you stay submerged long enough, your body will actually force you to inhale, even though your mind knows full well that the only thing that will enter your lungs is water. And that’s how you die from drowning. That’s what was happening to me. I knew it full well. I was thinking several things at once: The crashing of the waves would make it very difficult for anyone to hear me call out, provided I could get to the surface long enough to do so. But it was my best shot at getting out of this jam, because the chances of me swimming to safety were dropping precipitously. The fact that I’m writing this is the spoiler. The story has a happy ending. I did manage to resurface, call out and wave an arm. And then I did it one more time before my buddy Ben saw me. He and another friend swam out. The fact that I knew they were coming confirmed to me that even if I went under again, I was going to make it. Back on shore, it took me a good 20 minutes or so for my heart rate to calm down and my breathing to return to normal. Looking back it still amazes me how rational my conscious mind could be while the more instinctual part of me rapidly descended toward something akin to the exhausting and futile flapping of a fish out of water. Tackling risk is a balance between self-preservation and the urge to push your limits. I see it almost like a lifelong balancing act, a weird ying-yang thing where on one side of us is a primordial beast which sees things in terms of black-and-white, danger and safety, fight or flight. On the other, our more rational self lives, where there world is more nuanced, colored in varying shades of gray, hues of light and dark where choices and consequences aren’t so narrow, but instead limitless. And obviously, when they conflict to the point where one overrides the other in a stressful situation – frozen in fear or panicked reaction – you end up in big trouble. Or dead. In the middle is the sweet spot. Willing to look at a line on the rock, test it out, and then commit to a move that’s a hair or two past 100-percent safe. Or back off when the reward is indeed outweighed by the risk. I admire the ability of people who can do this when the stakes are high. Someone who can keep a level head and push their boundaries. The guy that can stay calm and talk their way out of a fight or, when that option won’t present itself, fight his way out of a jam without losing his cool. Striking that balance is what got us to the moon. It’s won battles, sometimes against seemingly impossible odds. It got Edmund Hillary and Tenzing Norgay to the summit of Mount Everest. It’s how we conquer fears and grow. More often than not, I’ve sharpened these senses by accident. I might be accused of being pretty dumb about it sometimes. But I’m also blessed to be able to think about it later. It’s those hard lessons, learned on the edge of life, that can be some of the most indelible.